Abstract: Periodic structure is made of a finite or infinite repetition of a unit cell in one, two or three dimensions. It has been intensively investigated in electromagnetics and widely used in metamaterials, metasurfaces, photonic crystals, frequency selective surfaces (FSS), slow-wave structures, diffraction gratings, etc. Metamaterials and metasurfaces are subsets of periodic structures whose unit cell is much smaller than the wavelength. By proper design of the subwavelength unit cell of a periodic structure, its macro properties can be engineered as we wish. This dissertation introduces three novel devices/phenomena which are based on 2D metamaterials/metasurfaces. This dissertation has three sections. In section I, a new resonance phenomenon is demonstrated in cavities which utilize both field polarizations. This resonance is formed by bouncing waves with similar handedness, between two simple anisotropic metasurfaces having a relative rotation. The rotated anisotropic metasurfaces can cross-couple the waves from one polarization to the other at the cavity ends. The field profile of the resonant mode does not exhibit nodes and antinodes, thus alleviating the length limitations of ordinary resonators. The resonance condition is theoretically demonstrated from both field and transmission-line perspectives, followed by eigenmode analysis that validates the existence of the new resonance. The dispersion of the anisotropic metasurface is also analyzed by transmission line model for the tenability of the resonance frequency. The concept is extended to guided waves and experimentally demonstrated in an X-band dual-mode circular waveguide, demonstrating a very short cavity resonance. The concept brings new possibilities for resonator design with size and tunability benefits at different frequencies. In section II, a metasurface diffraction grating for circularly polarized (CP) incident wave operating at 10 GHz is proposed. Such structure can provide auto-collimation for the CP incident wave. Unlike the conventional scatter, which would typically reverse the handedness of the incident CP wave upon reflection, the proposed grating can preserve the handedness. The auto-collimation blazing effect and handedness preservation are achieved with specially designed reactive impedance surface, which allows independent control of the responses to transverse electric (TE) and transverse magnetic (TM) polarization. Simulation and measurement are performed to demonstrate such effect, and comparison with conventional sawtooth grating is made. In section III, a novel slow-wave transmission line structure substrate integrated waveguide (SIW) is proposed and investigated. The slow-wave effect is achieved by the enhanced capacitance between the signal trace grid and periodic grounded patches on the same top layer. Such slow-wave effect can provide more than 40% size reduction in lateral dimension compared with the conventional SIW with the same cutoff frequency. At the same time, the longitudinal dimension can also be reduced by more than 40%. To demonstrate its applications, two-pole bandpass filters (BPF) built from conventional SIW and proposed slow-wave SIW (SW-SIW) are compared through simulations and experiments. The BPF implemented with SW-SIW reduces the size by 58.8%. Its measured unloaded quality factor (Qu) is up to 120.2. 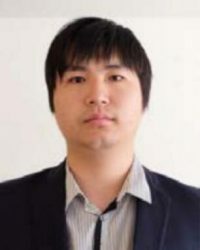 Biography: Xiaoqiang Li was born in China in 1991. He received his B.S. degrees in physics from Fudan University, Shanghai, China in 2014. In 2016, he received the M.S. degree in electrical engineering from the University of California, Los Angeles. Mr. Li is currently working towards his Ph.D. degree in UCLA Microwave Electronics Laboratory. His research interests include electromagnetics, periodic structures, metamaterials, antennas, and microwave filters.